Since being named Best Newcomer at the 2010 BBC Radio 2 Folk Awards Sam Carter has been stirring audiences from Camden to Canada, via an attention grabbing appearance on Later… with Jools Holland and a dreams-really-do-come-true performance in a specially assembled band to back Richard Thompson at Shrewsbury Folk Festival. 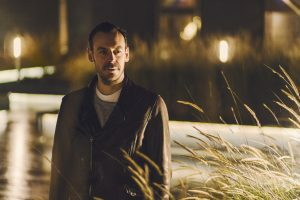 Described as ‘the finest English-style finger-picking guitarist of his generation’ by Jon Boden (Remnant Kings, ex-Bellowhead), Sam has toured the world, equally happy to perform intimate solo shows on acoustic guitar, on electric with a full band, or to collaborate with other artists. Recent collaborations have included Sweet Liberties , an EFDSS and Folk By The Oak joint-funded project which saw Sam, Nancy Kerr, Maz O’Connor and Martyn Joseph delving into the archives of Parliament in search of inspiration for songs about the pursuit and development of democracy. Sweet Liberties toured major UK venues, spawned an album of the same name and featured on BBC Radio 3’s World On 3 in late 2016. Sam’s third solo album How The City Sings was released in April 2016 and captured this fervently admired singer, songwriter and guitarist at his most passionate and moving, with The Guardian calling it a ‘bittersweet electric-folk concept album’ in their glowing 4-star review . The release was supported by a 15 date tour, culminating in the launch show at a packed-out Kings Place in London featuring the How The City Sings band; keyboardist Neil Cowley (Neil Cowley Trio, best known for his contributions to Adele’s 19 and 21 albums) fiddler Sam Sweeney (Bellowhead, Leveret and BBC Folk Musician of the Year) drummer Evan Jenkins (Neil Cowley Trio) and Sam’s longstanding bassist Matt Ridley.